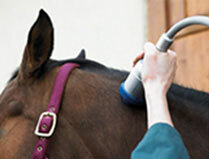 Dr Riggien offers chiropractic services for horses and dogs. Veterinary chiropractic is concerned with the maintenance of a healthy, functioning musculoskeletal system, with a particular focus on the spine. Veterinary chiropractic is useful in detecting spinal problems, and alleviating pain without the use of surgery or medication. It is a holistic approach to alleviating neck and back pain. It can also be used to enhance performance ability and maintain fitness in horses, and as a complementary treatment for lameness. Dr Riggien performs treatments to realign the spine and restore mobility to the joints in horses and dogs. Re-alignment is made manually by placing the hands on the affected vertebrae. Because the vertebral joints are quite flexible, they are handled with minimal force, and the treatment does not cause pain or discomfort for the animal. Does my animal need chiropractic treatment?